There's research, history, and real ingredients behind Tory Pratt's trio of cocktail syrups. What's in a bottle of tonic water? Sure, there's quinine, but there's also gross stuff—like high fructose corn syrup. Collective shudder. When flavor buff Tory Pratt learned what horrors lurked within the modern mixer, she set out to do a little research on how the OG drink was made. Years later, these delectable pre-prohibition-style syrups are the fruits of her labor. Try her tonic with gin and a splash of club soda for a fresher take on a classic, complete with fragrant citrusy notes. The grenadine, made with real pomegranate, makes a vibrant addition to Tequila Sunrises, and a little of her rich, caramelly take on a simple syrup goes a long way. (One bottle of the dark, double-simmered elixir holds enough to make 32 Old Fashioneds.) Lovers of history and booze alike will appreciate Tory's exhaustive research. After all, the results are tasty. Made in small batches in Washington, DC. When Tory Pratt was just a wee babe, her mom—a caterer—devised a clever game for them to play. First, she’d give Tory a spoonful of mystery food. (Hm… sounds ominous.) If Tory could identify all the ingredients, she’d win $5. With a palate like that, is it any wonder that she’s now spent years perfecting recipes for cocktail syrups inspired by years past? We say no, and thank goodness for that: 47 iterations later, her tonic is a delight. Speaking of, we’ll take a G&T. Makes having a cocktail party fun and easy. First off, the packaging is adorable. My husband's eyes lit up as he examined the wax seal stamped on each bottle. The product inside is quality. When I tasted the drink he made using the classic simple syrup, I assumed he must have used some top-shelf liquor. He said nope, it's the simple syrup! I felt like I was at a fancy lounge! I think he liked this better than his fancy tech gifts! Make delicious cocktails at home! I've been using these syrups for years and this syrup trio makes a perfect gift! After trying these syrups with the many recipes on the Pratt Standard website, there are certain drinks I'll only make at home (gin and tonic is one of them!) because they are so much better than the $13 version at a cocktail bar. This makes a perfect gift for anyone who loves cocktails. You can definitely taste the handcrafted quality taste in every drink. Delicious and fun trio for endless cocktail possibilities. I've bought from Pratt Standard for a couple years now -- can't wait to gift this. Comes in a nice box, although mine had a small tear in it. Kind of a bummer since it's a gift. The bottles were smaller than I thought they'd be, but I probably just didn't read the entire description carefully. I haven't tasted them as they're a gift, but I think they're going to be perfect. I highly recommend these syrups. They are absolutely fantastic for cocktails (the Tonic Syrup in particular is a family favorite for gin) and non-alcoholic drinks alike. 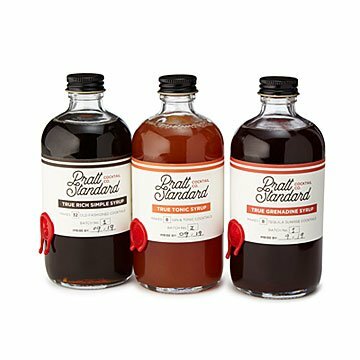 I started using Pratt Standards syrups a couple years ago and now stock my bar with them exclusive; the quality is bar none. The richness and depth of flavor in each of these takes your tasty creations to a transcendent level of enjoyment. And yes, I am on my second such creation...Cheers!